Toronto Raptors head coach Dwane Casey speaks to media on Wednesday. Until he hears otherwise, Dwane Casey remains the coach of the Toronto Raptors. The team did not make any leadership changes on Wednesday as Casey and Raptors president Masai Ujiri held their season-ending news conferences two days after their team was ousted from the playoffs by LeBron James and the Cleveland Cavaliers for a third successive year. Yet it remains unclear whether a change could still be coming. Ujiri said he has met with Casey, but he declined to say whether the coach, who took the Raptors to a franchise-record 59 wins this season, will keep his job. The Raps president said his evaluation of the year is continuing. Casey has the most coaching wins in Raptors’ history and is the fourth-longest-tenured in the league. In this, his seventh season as Raptors coach, he implemented a new offensive system without a major roster change, oversaw arguably the NBA’s best bench, coached in the all-star game and led the Raptors to the top playoff seed in the Eastern Conference for the first time in franchise history. While speculation was swirling over his coaching fate Wednesday, Casey was chosen coach of the year by the National Basketball Coaches Association – an award voted upon by his coaching peers. He’s also one of the front-runners for NBA coach of the year, which will be announced in late June. 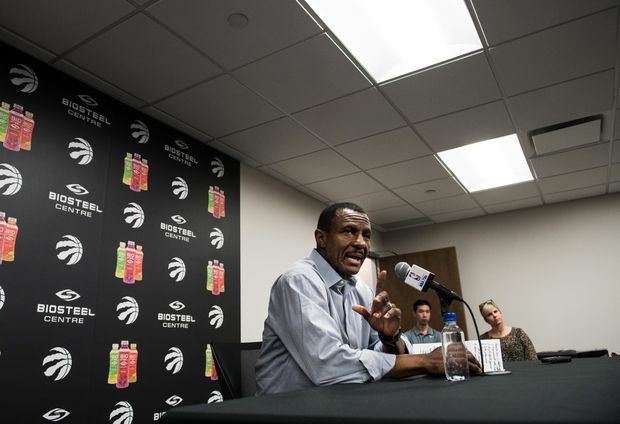 Both Casey and Ujiri were disappointed the Raptors were swept in the second round of the postseason, and pledged an unswerving devotion to achieving a championship. “If they want us to break this up and start over, you might get fined for using this word ‘tanking’, but no, we’re not doing that here,” Ujiri said. Ujiri said one part of his info-gathering will be to study why the Raptors were able to respond well after a couple of losses to the Washington Wizards in the first round of the playoffs, but were not able to bounce back in the second round against the Cavs. Ujiri harked back to a controversial play in Game 1 against Cleveland – when Kevin Love elbowed DeMar DeRozan in the face late in the game and was given an offensive foul for a play that officials refused to review. The next day the NBA upgraded it to a Flagrant 1, which if properly assessed at the time would have given the Raptors free throws and the ball, and could have swung the outcome of a game the Cavs went on to win in overtime. He wondered if the Raptors had won that game how differently the series might have turned out. Although very aware that the head coach is often the one to take the fall for such playoff failures, Casey went about business this week, having exit conversations with players and discussing their off-season steps for improvement.